As fixer in Mount Nemrut - Adiyaman / Turkey we provide services as: Fixer in Turkey, Kurdish - Turkish- Arabic - English - Zaza - English translations, Location scouting & Management, Equipment &Crew, Pre-production services, Filming permit, Transfers, Freelance journalist, Line producers. Since there is language barrier, it is challanging to apply / receive filming permit if you don't speak Turkish or do not have crew with Turkish citizenship. As we are experienced and arranged many filming permits for variety of filming projects, We would be happy to provide services as; Filming and photographing permit arrangement for filming in public properties or general filming permit for filming in Turkey, Refugee camps, Historical buildings or museums etc. We arrange General filming permit by applying national / provincial authorities, on behalf of you. With a diameter of 145 m and 50 m height funerary of stone chips is surrounded on three sides by terraces to the east, west and north directions. There are two separate antique processional routes radiate from the east and west terraces. Five bigger seated limestones statues are faceing outwards from the tumulus on the upper level of the east and west terraces. They are flanked by a pair of guardian animal's statues – a lion and eagle – at each end. The heads of the statues have fallen off to the lower level, which accommodates two rows of sandstone stelae, mounted on pedestals with an altar in front of each stele. One row carries relief sculptures of Antiochos’ paternal Persian ancestors, the other one is his maternal Macedonian ancestor. Crowning one of the highest peaks of the Eastern Taurus mountain range in south-east Turkey, Nemrut Dag temple built by the late Hellenistic King Antiochos 1st of Commagene (69-34 B.C.) as a monument for himself as he wanted people to worship to Stones and statues as they were their gods without thinking that they could neither benefit nor harm anyone never mind protecting them from any dangerous situation. View from the Mount Nemrut. 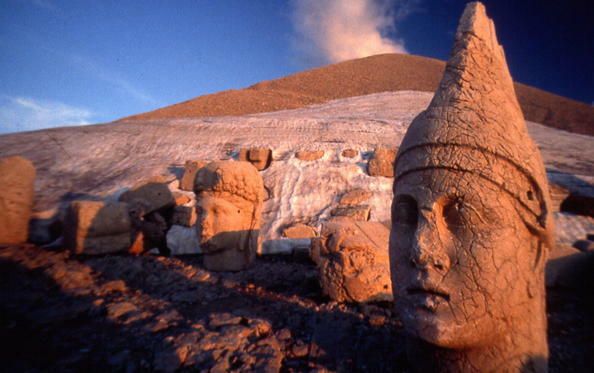 ﻿ Nemrut Dag (Mount Nemrud) is a mountain that sized 2,150 meters height. It is located near the village of Karadut in Kahta town of Adiyaman province. Kings of the Kommagene ruled Adiyaman and provinces around it from80 B.C. to 72 A.D . This kingdom, whose capital was Samosata, which founded around 80 B.C. by Mithridates the 1st, who was father of Antiochos the 1st. The kingdom's independence came to an end by attack of Roman legions in the last times of the Kommagene wars and it became part of the Roman province of Syria. Kommagene, extended from the Taurus mountains on the north to the Euphrates river on the east and southeast, to present - day Gaziantep on the south, and to the county of Pazarcik in Kahramanmaras on the west. The magnificent ruins on the summit of Mount Nemrud are not those of an inhabited site however. "Professor K. Dorner has traced the genealogy of Antiochos the 1st, who was himself born of a Persian father and a Seleucid-Macedonian mother. His findings indicate that Antiochos th Ist of Commagene had background, through his father Mithridates, from Dareios (Darius) the 1st (522-486 B.C.) and, through his mother Laodike, from Alexander the Great (356-323 B.C.). Mount Nemrud is located 100 kms from Adiyaman. Karl Sester, a German road engineer, rediscovered it in modern times in 1881. Also another expedition to Mount Nemrud was organized in 1882-83 by Karl Humann and Otto Puchstein, who published their findings in a book entitled Reisen in Kleinasien und Nordsyrien (Berlin 1890). Osman Hamdi Bey and Osgan Efendi who were researchers from Turkey also investigated the site in 1883 and their findings were published in a book entitled Le Tumulus de Nemroud Dagh (Istanbul 1883). F. Karl Dorner and Rudolf Naumann mounted an expedition to Mount Nemrud in 1938. Dorner returned to the site after 1951 and worked there with the researcher Teresa Goell who was from US. In 1984, a Turkish-German team led by Professor Dorner successfully carried out restoration work at the site, excavation and restoration work has been continuing since 1989 under the direction of Sencer Sahin. 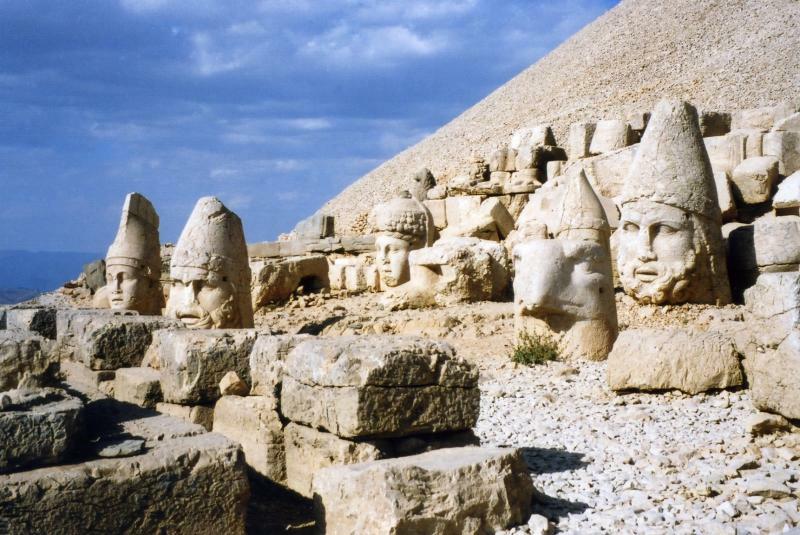 In 1989, Nemrut Dag and its environs were declared as a national park.